Model stitched on 16ct. Sandalwood or 14ct. Sage Aida using DMC floss. 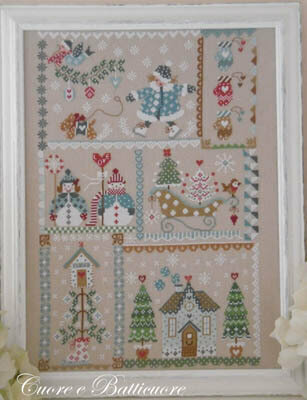 Stitch count: 89w x 149h. 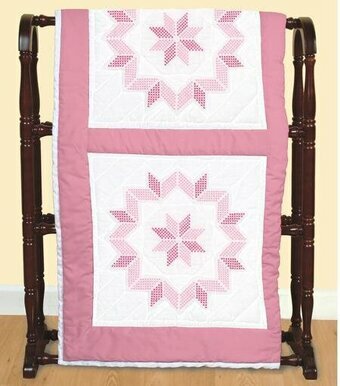 "I Place the pieces of my quilt in order and design. The path it takes the love it makes forever will be mine." 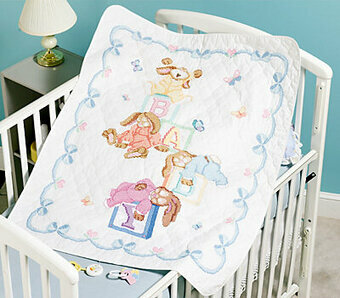 Cross Stitch Kit contains: Stamped pre-bound baby quilt, embroidery floss, needle and complete instructions. 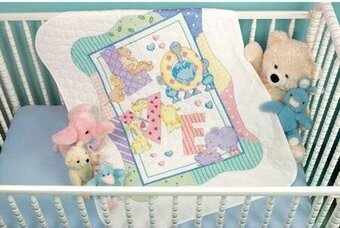 Coordinates with bib pair T21717 and birth records T21718. 34" x 43". 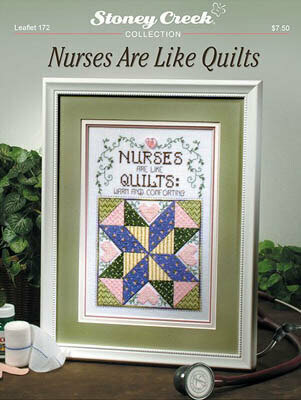 "Nurses are like Quilts: Warm and Comforting" Model stitched on 28 Ct. White Jazlyn with DMC floss, Threadworx, and Mill Hill Treasures. 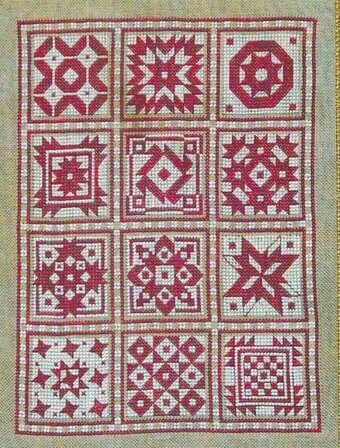 Stitch Count: 86W x 130H. Model stitched on a 20 x 10 inch piece of 28ct. White Cashel linen using DMC. 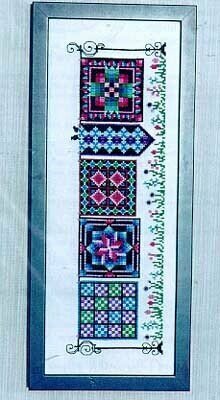 Size of finished design: 14 1/4 x 4 1/2 inches. Models were stitched over two threads on 30 Ct. Tin Roof using Classic Colorworks floss (or DMC 318, 3865, 310, 3836, 722, 904, 472, 938, 3862, 153, 304, 815, 744). 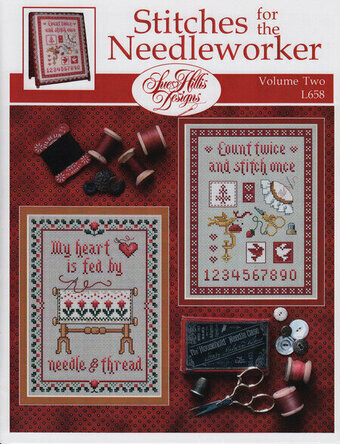 Stitch count for Cardinal 31x50, Racoon 32x48 & for Moose 31x51. Model stitched on a 16 Ct. Evenweave Throw Afghan and 14 Ct. White Aida (for ornaments) over 1 thread/square and on the 28 Ct. White Jobelan over 2 threads with 2 strands of floss for cross stitching. Stitched using DMC, DMC #5 Pearl Cotton, Kreinik #4 braid and optional glissen gloss. 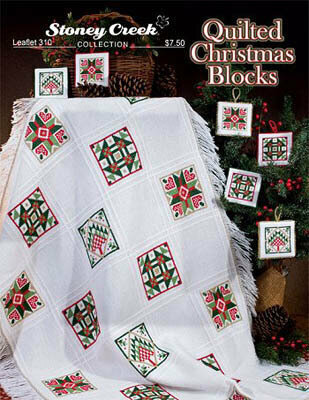 Stitch count for each block is 32x32. Model stitched on 28 Ct. Relic Cashel Linen from Picture This Plus with DMC floss. Stitch Count: 88W x 88H. 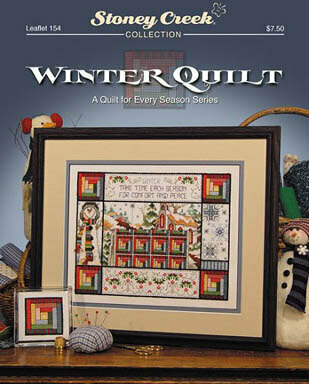 "Quilt A" model stitched on 14ct. Sage, Khaki, or Bone Aida. 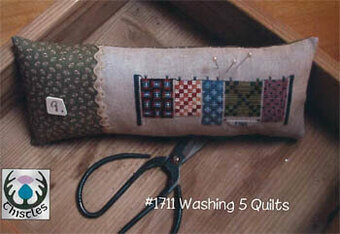 Stitch count: 58w x 88h. 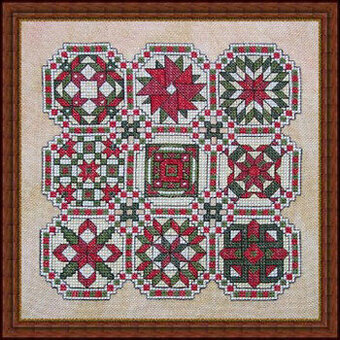 "Quilt B" model stitched on 14ct. Taupstone, Sage, or Mushroom Aida. titch count: 71w x 92h. 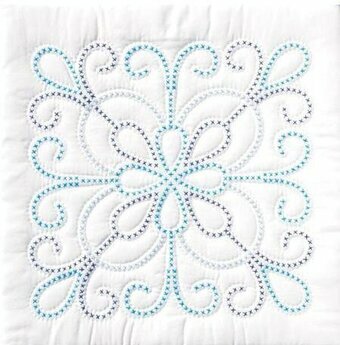 "Quilt C" model stitched on 14ct. Sage Khaki, or Taupestone Aida. 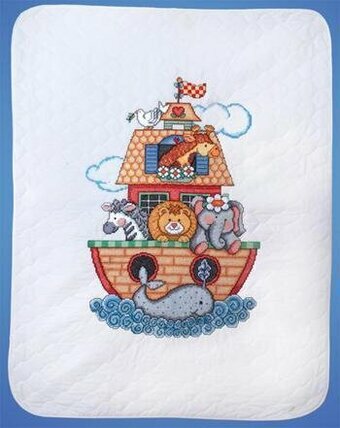 Stitch count: 63w x 81h. All models stitched using DMC floss. 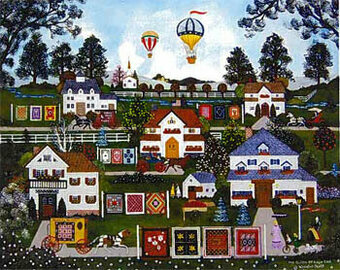 This quilt is a beautiful show of skill and needlework. The printed blue ink easily washes out of finished projects. 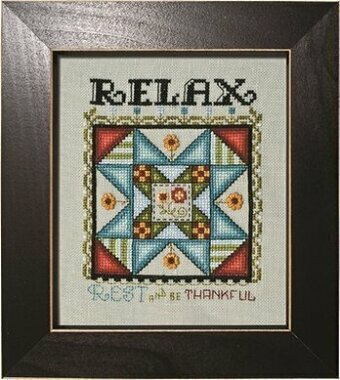 This package contains one 36x42 inch piece of blue poly cotton material stamped for cross stitch and instructions. Floss, backing, and batting NOT INCLUDED. Made in USA. "My Heart is fed by needle & thread." 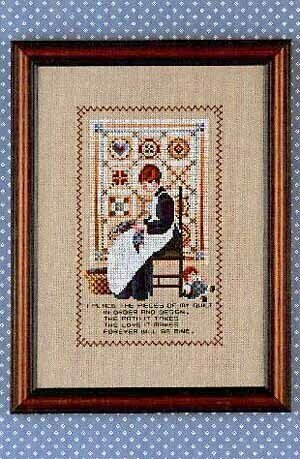 "Count twice and stitch once." 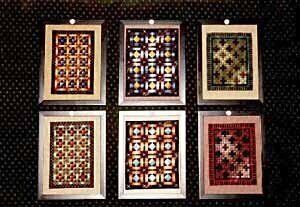 Models stitched on fabric of your choice with Sullivans or DMC floss. 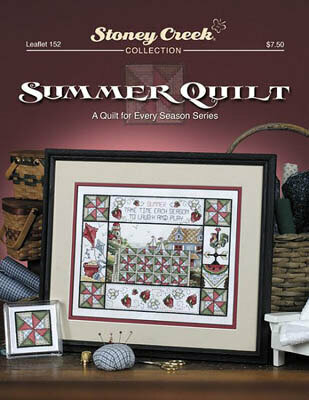 Stitch count for each sampler is 76x104. Model stitched over 2 threads on 32 Ct. Raw Belfast linen with Gentle Art Sampler threads (or DMC 221, 310, 436, 890, 902, 930, 950, 3052, 3752, 3072, 3865, 3041). Stitch Count: 77x28. 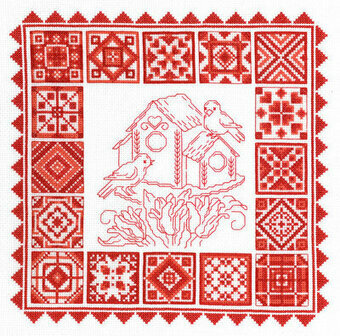 Complete kit contains cotton thread, design printed in wash-away ink on prefinished poly/cotton quilt, needle, and easy instructions. Design Size: 34" x 43". Designed by Cathy Heck.